A Smart Energy Switch plugs into any power outlet in your home and turns it into a smart outlet. Any device you plug into the outlet can then be controlled remotely and can have the energy usage monitored in real-time. 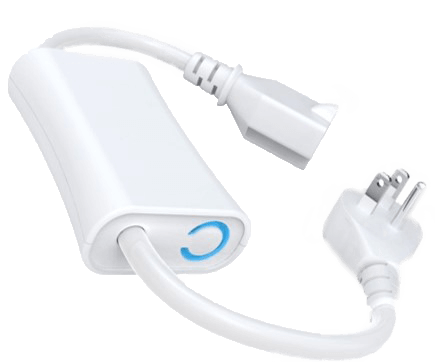 With a 15 amp max capacity this is great for connecting desk lamps, crock pots, cable boxes, beauty appliances and much more. Turn the connected device on or off from your smartphone, tablet, or computer. Conveniently turn the crockpot on before you arrive home or turn off an appliance you may have left on when you went out. You can also turn your electronics off quickly in the event of an emergency or potential hazard at home. Easily set smart schedules to have the connected device turn on or off at certain times on specific days. For example, save energy by scheduling your cable box to turn off during the weekdays or manage the kids TV and gaming systems to shut-off when it’s bedtime. The smart energy switch measures the total consumption of electricity of the connected device. See a breakdown of energy usage by device and overtime and learn exactly what it costs you so you can find areas to save.